← Cannabis Coffee Shops in the UK? 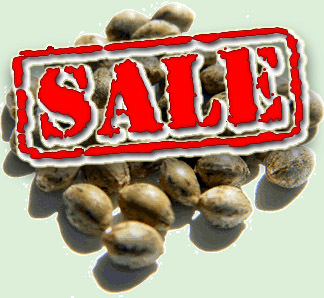 Now this is something of a grey topic in the UK, as the law states that there is nothing illegal about selling seeds, or indeed buying as many cannabis seeds as you want. However this does become illegal the moment you germinate them…and the law is quite clear on that point! I’ve been doing a bit of research into the best places to buy seeds from, and so far I’ve tested two of the larger online stores with small purchases. I’ll give my reviews on these below, and hopefully I’ll be able to add to this list when I get round to buying more seeds from different outlets. I bought 3 x Sweet Seeds Fast Bud Fem Autos on their site. The checkout process was simple and took about 5 minutes, I felt like I could trust these guys with my credit card details. I received my order two days later in a plain brown jiffy bag. Opening the pack I saw a DVD case, and inside that I found my seeds packed securely in a tiny phial. Also included was a rather chavvy looking orange wristband and a copy of my invoice. No free seeds from this site. All in all I felt comfortable ordering from this site, and the only two negative points is that on the back of the jiffy bag was printed the URT1 name and return address. A quick search of Google for ‘URT1’ would have told anyone with half a brain what was in the jiffy bag. The other negative point was that I wish they hadn’t packed the invoice with the goods. If it had gone missing and been opened then all my details were on that piece of paper – I had an e-copy of the invoice so there was really no need for them to include a paper version with my order. The ordering process felt safe and secure and I got through the checkout procedure with no problems. The goods arrived two days after ordering, and again it was just a plain brown jiffy bag with a black DVD case inside. Inside the case was my order (packed nicely into a tiny phial), as well as free seeds which were packed into a little round plastic case. There was no invoice, which I was pleased about. There was a return address printed on the back of the jiffy, but no business name. Overall I felt more comfortable ordering from Herbies – not just because I got free seeds, but because if the seeds had been intercepted then there would be no trail back to me! More test orders to follow soon…if anyone else has ordered from other sites it would be good to hear what you thought of the ordering process. This entry was posted in General and tagged buy cannabis seeds, Cannabis Law, seedbanks. Bookmark the permalink.